Former president George H. W. Bush is recovering after falling and breaking a vertebrae in his neck at his summer home in Maine on Wednesday. His condition is reported as being “very stable” by the admitting hospital—though he will be wearing a neck brace until the bone heals. The neck brace Bush will have to wear serves to keep the neck immobile and is typically employed following damaged vertebrae, since excess neck movement can lead to paralysis or death from spinal cord injuries. 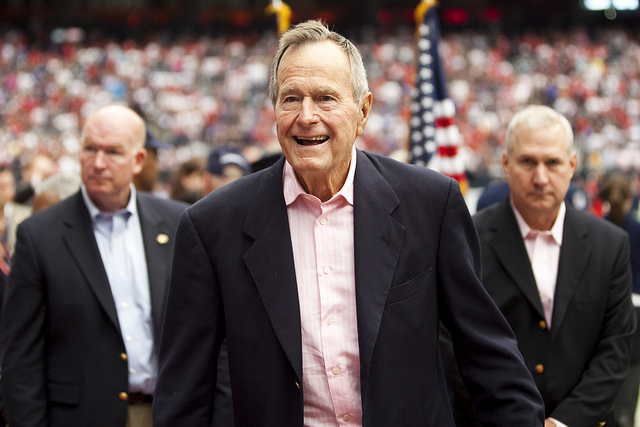 Bush was admitted to the Portland Maine Medical Center, the same hospital that treated him for shortness of breath in 2014 and for a lengthy bronchitis episode in 2012. He currently suffers from Parkinson’s disease and cannot use his legs, requiring a scooter or wheelchair. Despite his age and apparent fragility, Bush has remained active. Earlier in the month, both he and his wife appeared at several presidential campaign events held by his son Jeb. Bush also went skydiving to celebrate his 90th birthday last year and parachuted for his 75th, 80th, and 85th birthdays. People in their 50s have a 16% risk of experiencing a vertebrae fracture, with the risk increasing as they age. Experiencing one fracture increases the risk of developing another, either in the vertebrae or elsewhere in the body. The International Osteoporosis Foundation estimates that as many as 45% of vertebrae fractures in North America never reach clinical attention. Carey-Mahoney, R., “Family ‘optimistic’ after Bush 41 Falls, Breaks Neck Bone,” USA Today web site, July 16, 2015; http://www.usatoday.com/story/news/politics/2015/07/15/george-h-w-bush-fell-breaks-neck/30221315/. “Facts and Statistics,” International Osteoporosis Foundation web site, http://www.iofbonehealth.org/facts-statistics#category-17, last accessed July 16, 2015. Bohn, K., et al. “Former President George H.W. Bush in the hospital after fall,” CNNPolitics.com, July 16, 2015; http://www.cnn.com/2015/07/15/politics/bush-41-hospital-fall-maine/index.html.